Contemporary western philosophy divides into three broad traditions: the analytical, the continental, and the historical. In the latter half of the twentieth century, analytical philosophy was dominant in the English-speaking world and tended to ignore the other two traditions. Now, however, analytical philosophy is less isolationist. It has come to appreciate the vitality of historical philosophy. Given their commonality of interests and shared appreciation of the values of conceptual clarity and argumentative rigour, it is particularly appropriate that there should be engagement between the main English-language tradition and the philosophy of Aquinas and, more broadly, of Thomism. The essays in this collection range widely across the fields of metaphysics, epistemology, philosophy of mind and action, and theory of value with most linking analytical and Aristotelian-Thomistic ideas and some focusing on Aquinas in particular. This collection is distinctive in content and unusual in North American publishing in the areas of medieval philosophy, scholasticism, and Thomism in that the majority of the contributors are based in Europe – many at medieval universities in which scholasticism had a historical presence, and in some cases a prominent and distinguished one. Mind, Metaphysics, and Value brings together the interests, knowledge, and expertise of a wide range of scholars to form a broad and exciting intellectual community. Read Mind, Metaphysics and Value. 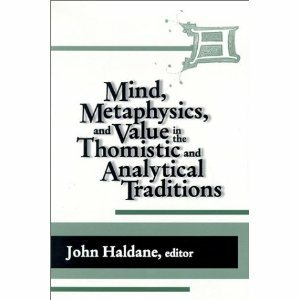 “[Haldane] hopes that this new collection of essays will foster “interactions and exchanges between analytical and scholastic, but especially Aristotelian-Thomistic, philosophies” (p.x). This is a welcome change from the usual tendency of Aristotelian-Thomistic philosophers to limit themselves to the interpretation of classical texts. This collection of essays abounds in arguments and theories that are well informed by both analytical and Aristotelian-Thomistic thought”. — Jeffrey Brower, Notre Dame Philosophical Reviews.